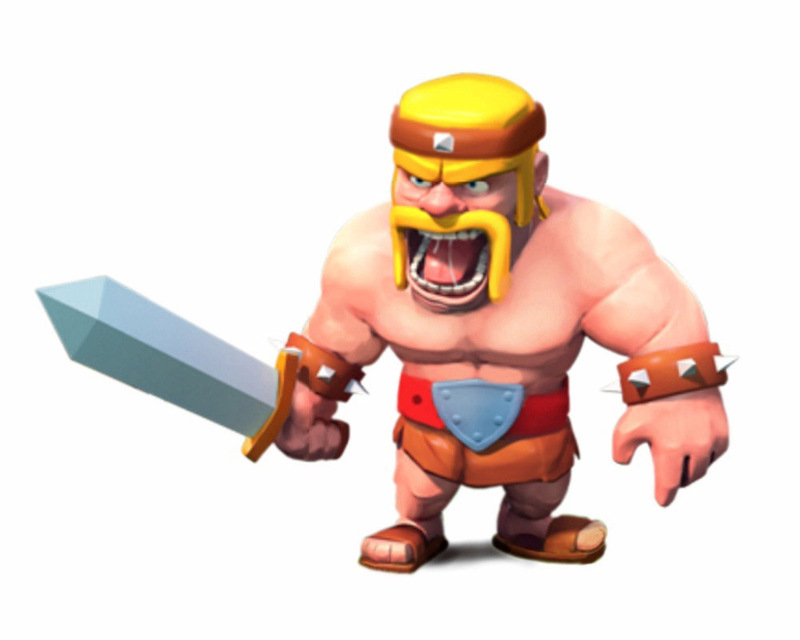 The Barbarian is one of many Regular Troops in the Clash of Clans game. The Barbarian is a kilt-clad Scottish warrior with an angry, battle-ready expression, hungry for destruction. He has close-cropped blonde hair and a long, yellow horseshoe mustache. 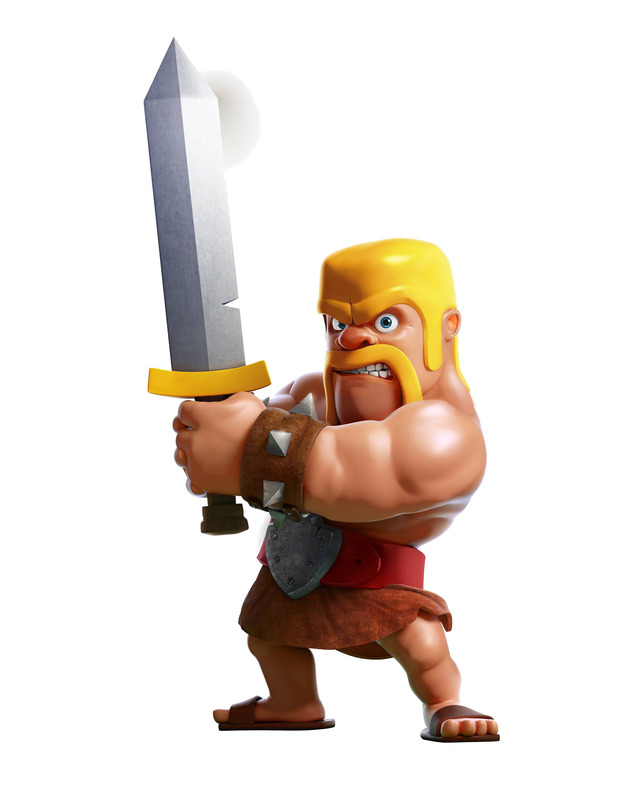 The Barbarian is the first troop unlocked in the Barracks. Barbarians have no preferred target when attacking; they will simply attack the closest building to them. However, once they become aware of enemy Clan Castle troops, Heroes or Skeleton Trap skeletons (either by being attacked themselves or being near another friendly Troop under attack), they will leave their previously targeted building and engage the enemy Troops instead. Once all of the nearby enemy Troops are defeated, they will proceed to attack the nearest building from their current location. Description of common tactics of usage a Barbarian on a battlefield is Here. Upon first receiving the Barbarian, he wears a brown kilt with a leather belt and a steel shield-shaped buckle. He also has spiked wristbands on both arms, as well as a short claymore in his right hand. He wears a pair of leather sandals on his feet. At level 3, the Barbarian gains a leather headband and a bigger, longer claymore. 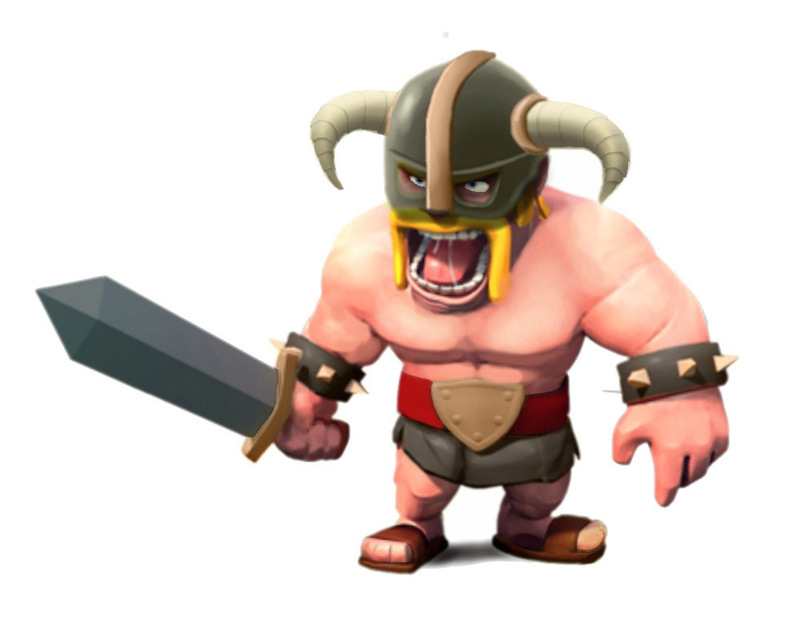 At level 5, the Barbarian’s headband is replaced with a Viking helmet and his claymore changes to one made of bronze. At level 6, the Barbarian wields a dark iron claymore and sports a mighty horned helmet, complete with face mask, similar to that of the Master League symbol. All accoutrements (kilt, belt, wristbands, and sandals) turn a darker shade of brown as well. At level 7, the Barbarian replaces the dark claymore with a lighter-gray one that appears to be molten on each edge, and his horned helmet gains a gold accent along with gold horns. The spiked bracelets on his wrists turn black, and the spikes become gold. 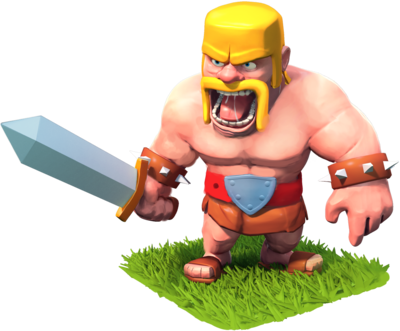 Of the three Tier 1 troops (Barbarian, Archer, Goblin) the Barbarian has the highest health and does the second-most damage (Goblins of similar level have higher damage per second). He is also the slowest-moving but fastest to train. When you tap on an Army Camp, all the Barbarians stationed there will briefly raise their sword. You can have a maximum of 240 Barbarians at one time in a complete set of fully upgraded Army Camps. This number increases to 275 if you include the 35 that can fit into a fully upgraded Clan Castle. 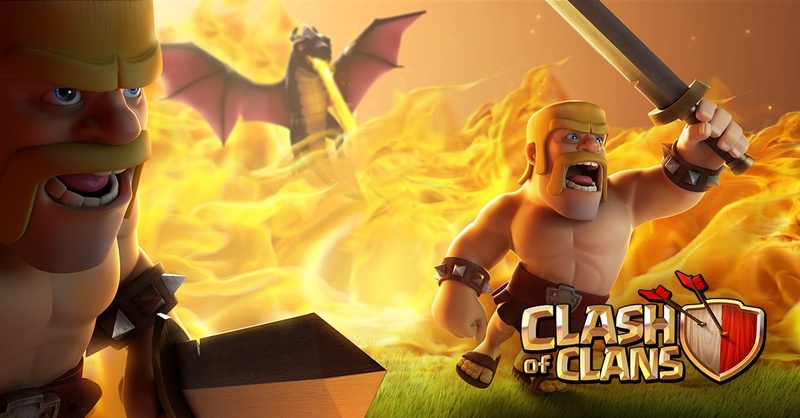 On the battlefield, you can summon 20 additional Barbarians with a maximum-level Barbarian King. The level 6 Barbarian’s helmet greatly resembles the iron helmet from The Elder Scrolls V: Skyrim. It is also the one worn by the Last Dragonborn in Skyrim’s trailer. Barbarians bear more than a passing resemblance to actor Hulk Hogan. 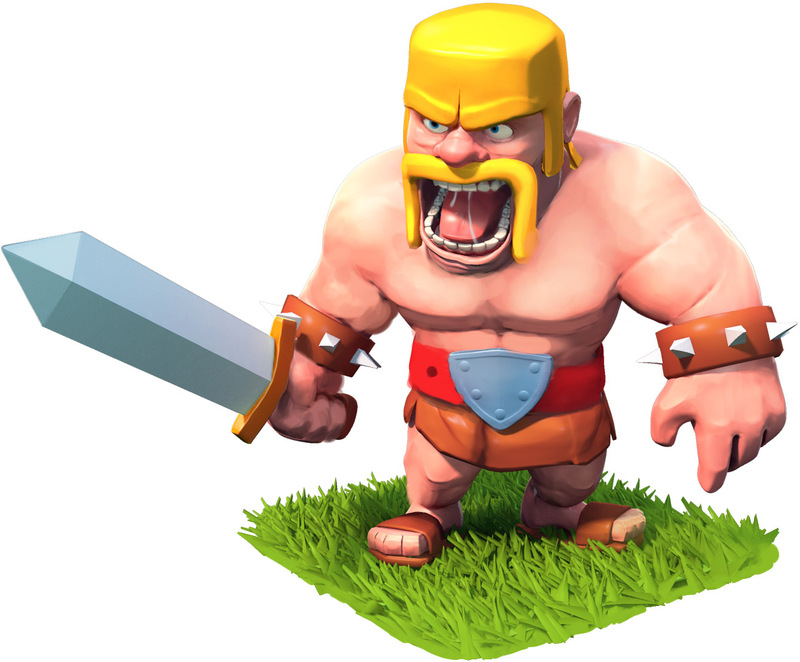 Barbarians, along with Archers and Giants, are currently the only three troops that can be upgraded to Level 7. The Barbarian is the trademarked logo for Clash Of Clans. As of the July 1, 2015 update, the training cost has been increased in levels 4-7.